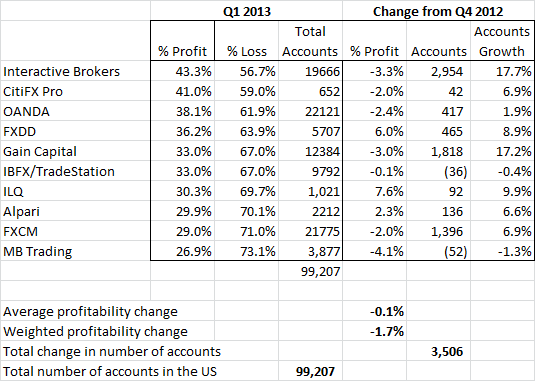 US brokers have filed their profitability reports for Q1 2013. During the quarter, along with increased trading volumes, the US retail FX industry also saw account growth take place for the first time since Q 2012, as total active traders grew 3,506 to 99,207. The largest advancements of new accounts were seen at Interactive Brokers which registered 17.7% and Gain Capital where active traders grew 17.2%. Figures at Gain Capital were assisted by its recent purchases of US customers from FX Solutions which had 3726 active traders recorded at the end of Q4 2012. On the heels of a weak 2012, and steady declines taking place in US forex traders, the growth is a welcome relief for the industry. Although FX trading was highly active during the quarter and is being cited as a primary interest for renewed interest in the asset, US brokers also had to compete with a bullish US equity market. Although the volatility is favored by traders, profitability among customers dropped 1.7% on a weighted average. Despite a 3.3% decline in account profitability, Interactive Brokers held onto the top spot followed by CitiFX and OANDA. Among outperformers, FXDD stands out as client profitability rose to 6.0% to 36.2% along with total active accounts increasing 8.9%. Interestingly, since the first report traders who have traded with brokers that used to offer higher leverage e.g. above 50 to 1 have had an overall increase in profitability. In Q1 of 2010 Oanda’s clients recorded 51% profitability. • Interactive Brokers maintains its position as the most profitable broker for clients, in fact the top three are unchanged since the previous quarter. • Only 2 brokers, MB trading and IBFX lost accounts. 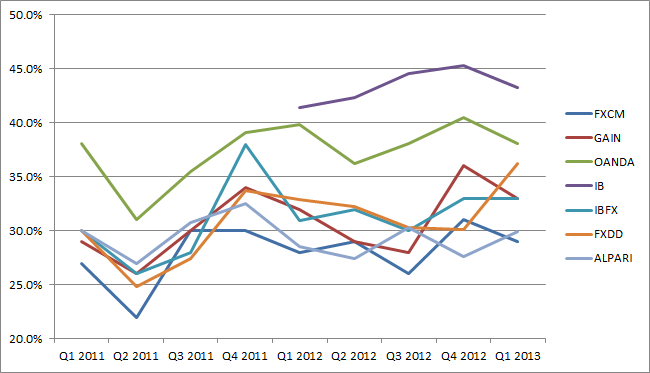 The previous quarter ended with the Cypriot debacle and volatility has somewhat increased. The benchmark VIX index touched a five and a half year low in January 2013, thus showing signs of optimism in the global equities market. The VIX is currently trading at 15.53 and in Q1 2013 it has had modest movements, compared to the intense volatility in the height of the recession e.g. October 2009, May 20 10 and August 2011. IB deserves credit. They are leading in every category. More accounts, equity, profitable traders..good job. Fxcm and oanda account opening minimum are $50 and $1 where as with IB it is $10k. That should give you an idea they r the largest broker in U.S. and they attract Savvy Traders like me.